Many of our students are the first in their family or even the first in their community to seek a higher education. Their friends at home do not understand the difficulties they are facing in their university courses or the struggle and loneliness involved in moving to an unfamiliar city. Even when their families support their educational goals, they don’t always understand the need to remain away from home on weekends in order to spend time in the computer lab or pursue extra-curricular activities. We believe that an important ingredient in their success involves making new friends with other students who share their rural roots. We can not be with our students to help them navigate their individual campuses so we instead invite them to join us for an annual Student Conference. The conference provides an opportunity to be exposed to new ideas and new horizons. The young high school students interact with college students who are already accomplishing goals they can barely dream of. Lots of group activities promote the emergence of new leaders. Everyone has a chance to participate. For the staff it is a pleasure to watch once shy beginners develop into confident leaders as they return year after year. The 2016 Progresa student conference was one of the best ever. Almost 90% of the students managed to participate during at least one of the two days. In addition we counted 4 ex-students, 4 board members and of course Miguel, Jaime and Yesika. Aside from the informal fellowship and networking that takes place when our students come together from a ll over the country there were three different presentations and lots of opportunities to interact with one another. As soon as the buses arrived from Xela and Coban, Miguel gave a thought provoking summary of the growing water problems in Guatemala. Use, abuse, and inequitable distribution all play a role in the developing crisis. Following his talk, the students met in small groups with the assignment of listing specific water problems they are experiencing in their communities and generating possible solutions to these problems. Later on Saturday Victor Yacon, one of our 6th year medical students , led an engaging and participatory workshop on cardio-pulmonary resuscitation. His presentation was part of a community service workshop he had developed for the volunteer firefighters in his area. On Sunday our “keynote” presentation was made by Hector Canto, a former Progresa student who was recently appointed Vice-Minister for Education. Hector was already a teacher when he received a Progresa scholarship to study law. At the same time he took courses to complete his “licenciatura” in education. He was such an outstanding student that when he graduated he was awarded a fellowship to work for one year in the department of education. The fellowship also included payment of his tuition for a Master’s degree in educational administration at the University Del Valle, one of Guatemala’s top private universities. After his fellowship, Hector returned to his law studies and completed his coursework and much of his thesis but put it all aside when in January he was appointed to the position of Vice-minister under the new Jimmy Morales administration. Hector’s well organized presentation provided us with lots of hard data about Guatemalan primary and secondary schools, funded by a scant 2.9% of the budget. Working from the admittedly inadequate state of affairs he led us through the 5 year plan the Ministry has devised to improve the system including improvement of access to education, training of teachers and administrators, and improved inclusion and retention of students. As well as giving information, Hector was eager to have our students give feedback about the problems in their communities and asked them to generate potential solutions. He plans to get input from other young people as well. Perhaps even more important than our goal of providing new information to our students is our goal of helping them to get to know each other and feel like they are a part of a network of Progresa people. With this in mind we have added more and more group and play opportunities. The Saturday evening “Cultural Night” involved songs, skits, jokes and participatory games which were planned by three different student groups. In the afternoon some highly entertaining cooperative games were organized by Miguel and Jaime with the same three different regional teams competing against each another. A favorite involved the backwards passing of open containers of water, with the expected spilling and laughter. On Sunday morning the students had the option of participating in a different kind of group activity. They were invited but not required to attend a Quaker meeting before the officia l conference began. We were surprised (and delighted) when more than 50 students joined us in the garden under the trees and the singing birds. It was a deep and rewarding meeting with vocal participation by several students. 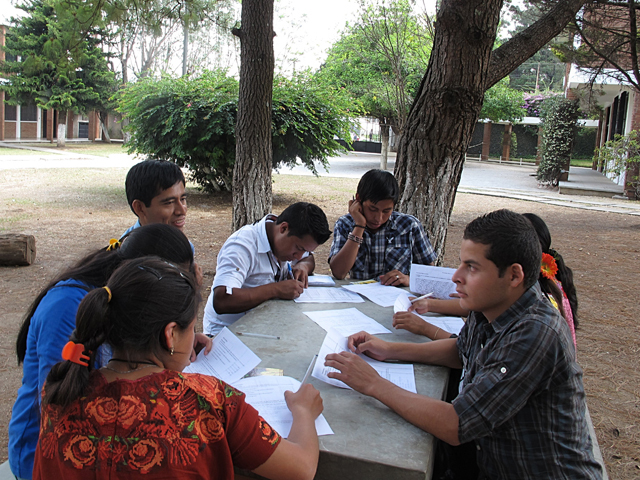 2014 Conference "Activity for Activism"
On May 3rd and 4th, 2014, 75 PROGRESA scholarship recipients gathered in Mixco, Guatemala, for the annual Student Conference. Organization of the conference was in the hands of SERES (http://projectseres.org), a Guatemalan based organization that does workshops on leadership training and organizing for community action. The goals were twofold, to build the PROGRESA community and to help the students prepare their community service projects. The day and a half was a fast paced alternation of lively outdoor group building activities, creative exercises, and time spent discerning leadership gifts and ways to go forward in community activity. All activities worked on building community. As the workshop progressed, members were brought into first general and then more specific discerning and planning stages for their community service projects, an integral part of the PROGRESA program. Students were randomly divided into working groups, which supported the building of ties among those who were formerly strangers. There was much hilarity, creativity, bonding, and a lot of good work done. Several North American Quakers from the Advisory Board were also in attendance, following a board meeting the previous day. They were enfolded into the program, providing opportunity for two way learning and understanding about the PROGRESA program and those involved in it. A Quaker Meeting for Worship was held on the final day, with over 20 students in attendance. This was a rich time of spiritual sharing and hope for the future. We leave the conference with a renewed sense of commitment and hope, love and admiration for the staff and students of PROGRESA, and immense gratitude for the privilege to be involved in such a positive, world changing institution. 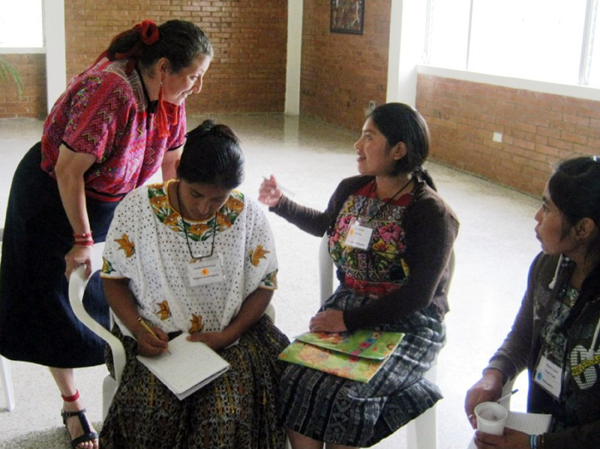 In 2013 the entire conference focused on the importance of reading and writing for the development of the individual and Guatemala as a whole. On Saturday a workshop which addressed writing focused specifically on the task of writing a letter to one’s sponsor. Using this simple task the students were guided in the steps of generating ideas, deciding what they want to convey and then organizing their ideas on paper, editing, and rewriting. During the Sunday conference, Marielos Porras, a master teacher and reading expert, described steps for involving young children in the reading process and motivating them to think about what their hear. 2013 also marked the 40th anniversary of the Guatemala Friends Scholarship Program. Members of Redwood Forest Friends Meeting, Pacific Yearly Meeting, Mexico City Friends Meeting and Multnomah Friends Meeting joined us at the conference to offer their congratulations and help us celebrate. In a simple but moving ceremony 36 students, each carrying a small bag of candies, called out the number of Progresa students who had finished their studies in each year beginning with 4 in 1977 and ending with 24 in 2012. By the time that the last student had added his 24 candies representing 24 graduates in 2012, the large glass jar was filled to overflowing with 1116 “dulces”. To learn more read Joe Snyder’s article entitled “1116 Dulces” in the Spring 2013 Update. 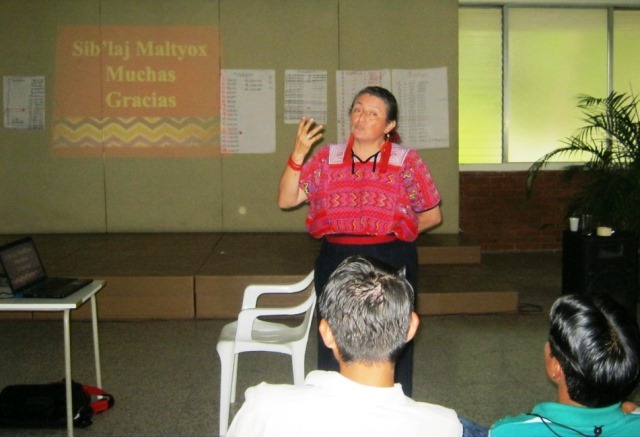 This year the principal theme of our annual conference was an explanation of Oxlajuj Bak’tun or the end of the Mayan calendar. Our invited speaker was Lina Barrios, a recognized Guatemalan anthropologist, who has conducted multiple investigations of both ancient Mayan culture and the current culture in Mayan villages. She has received various acknowledgements at both the national and international level for her work. Lina explained that the Mayans had several different calendars which had different purposes and that the “Choltun” or long calendar as it is called was only one of these. This calendar was divided into lengthy periods called Bak’tunes, the last of which, the 13th Bak’tun, will finish on December 21st of this year. In her conclusion, Lina explained that the end of 13 Bak’tun does not have an apocalyptic significance. If it had a special meaning for the ancient Mayans, it was that it represents the end of an era or cycle and it would be an appropriate time to meditate on the direction humanity is headed. At the very least it is a time of privilege and space to analyze the good and the bad we have done and examine our relationship with mother nature and the universe in general as well as providing an opportunity to correct any errors we have made.